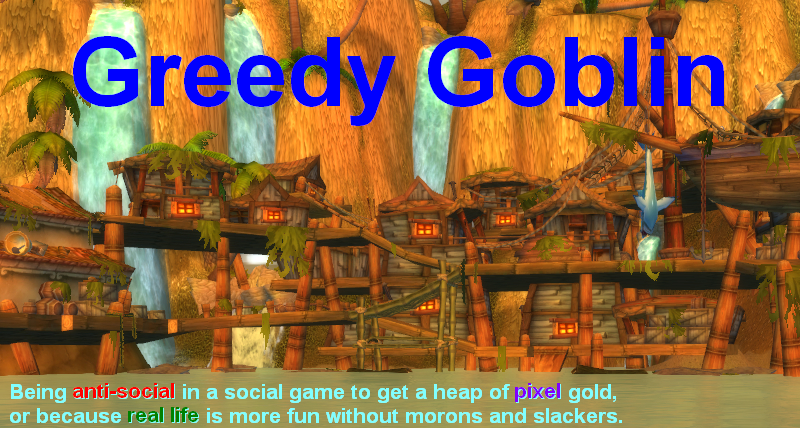 Greedy goblin: Strategy beats "skillz"
As you can see, they had 47 killing blows, we had 14 (we were the horde). They did 10.7 M damage, we did 7.9. They did 5.5M healing, we did 4.6. So they were better in every meaningful way. Except they lost 2000:1010. The opposing team was unable to adapt to the strategic situation. At the start we ran to LH on the water, so they were surprised (no guard on water). They were zerging WW where we sent two tanks, when when the LH guarding guys started yelling, most turned back, leaving no healer at WW. So they ended up with no base and could kill us at LH only after 1000:0. They surely have better gear and practiced their rotations more (that's why they had all the kills and damage and healing), but they used these in an ineffective way. The communistic "we are all equal, our differences can only come from effort" nonsense that plagues MMOs in the form of "anyone better than me is a no-lifer" is most obviously defeated in rated BGs. A bunch of players with better gear and better motor skills can be defeated by a smarter opponent. Of course it's true for PvE too, but hard to prove, as the loser can always believe that the winner plays more. They want to believe it, because they don't want to face that they are just less intelligent or educated. How can we decide that something is "strategic"? Simple: someone with intelligence, but no gaming knowledge can come up with the right answer after the situation is described in a few sentence. For example if I tell my mum that "on Arathi Basin 15 players fight for 5 flags", she will be able to tell that fighting away from flags or zerging one point is wrong. Yet we see geared, lvl 85 players, who obviously played 100+ hours, making these mistakes. It's obvious that "experience" doesn't help here. I mean my mum spent 5 seconds listening to "on Arathi Basin 15 players fight for 5 flags", so the 100 hours guy has 72000x more "game experience", if it wasn't enough for him, I don't know what will. The existence of strategic decisions beats the loser's favorite claim: "games are need only effort (and maybe motor skills), so being good at them means nothing but too much time on your hand". No time ever will teach you to not fight on the bridge. Intelligence lets you figure it out, and education lets you learn it from those who figured it out. When someone says on /bg "fight at bases, not at bridges", you are being educated, and without any intelligence could follow this advice. So when we see someone doing a strategic mistake, we can be sure to see a moron, someone with low intelligence, and a slacker who did not read up, as everything of the game is written down. Even AB strategy. There is one slight hope that we just see a misguided player who was made believe that he can leave his brain at home and doesn't stop and think before acting. If someone does so in our rated BGs, I make him stop and think... by kicking him from the BG group for a day with the hope that next day he'll know that thinking > mashing buttons. Personally, in random BGs, it's very unlikely the experienced guys don't have the intelligence required to devise an effective strategy. I believe that why they don't is part fatalism, part social responsability dilution. Fatalism: "Why should I try my best, the rest of the team is obviously full of morons, I can't win the match alone". Social responsability dilution: "I could defend the flag, but that's no fun. Let 'others' defend the flag, and I shall have fun. If others defend flag, then we win and on top I had fun too by pwning faces." 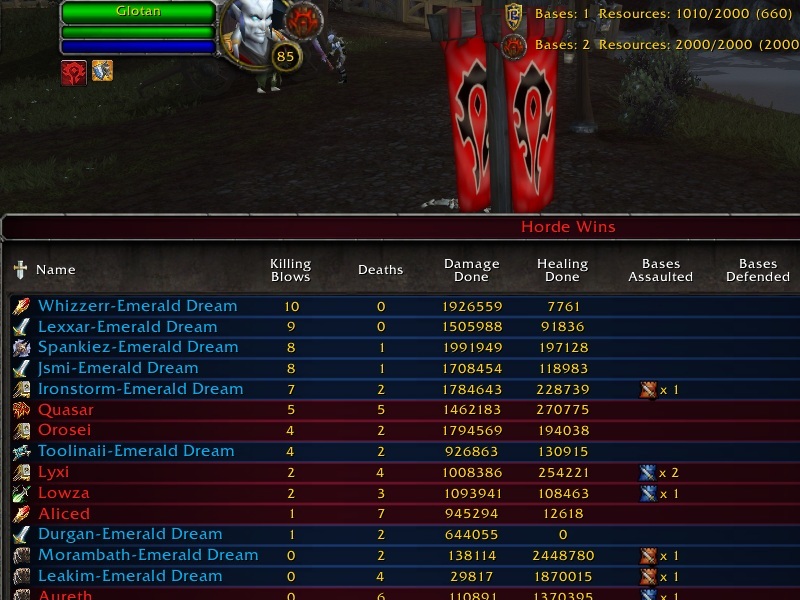 Rated BGs are a different kettle of fish, though. In any case, lack of intelligence is not the only reason. There's also lack of willpower to apply the intelligence. So when we see someone doing a strategic mistake, we can be sure to see a moron, someone with low intelligence, and a slacker who did not read up, as everything of the game is written down. This conclusion does not follow, unless you are defining "strategic mistake" in a tautological way. In that Rated BG, all you demonstrated was the usefulness of the element of surprise and how a lack of further coordination on the enemy's part gave you a large enough margin of victory. As you said, they left no healer with them at WW when they tried to counter-attack. That was the raid leader's fault, and it put them too far behind to reasonably catch up. Had they successfully taken WW and driven you back into the sea at LH, as it were, would you have written a post about how you and your group was a moron, with low intelligence, and a slacker? Your arguments are almost all the time flawed for the last months, since you think that things are black or white. "If she doesn't fight near flags she is moron". Well after 6 years playing this is not the case any more. Of course there are morons. But most of the time this is boredom, "fun" factor (yes, with "" since for some people winning is not the objective but only to kill things that are moving) or even fatalism as Lyxi said. @Ray: licking window and sitting in the corner drooling are fun for me, I'm not a moron. @Azuriel: it's defined as "something that can be figured out by an unexperienced but intelligent person". @ Gevlon: "Also, if they wouldn't make strategic mistakes, they would have won, so the match wouldn't be a good illustration to the post (yet it wouldn't be a counterexample, it would merely prove that if all else are equal, motor skills decide)"
a) If you win, then it's because of your superior intelligence. b) If they win, it's just because they are better geared / better reflexes. a) If kid wins, then it's because they're 1337 / fully sik / aw35ome. b) If they win, it's because they're better geared. @Squishalot: I've never said that we never make strategic mistakes. The "kick" part at the bottom refers to that. I also never said that we always win with strategic advantage, we often win only by small margin, simply by having better motor skills. Actually I wasn't talking about us, just used one of our rBGs as EXAMPLE. @ Gevlon: I know, I actually didn't have any issue with the blog post itself. My point was more aimed at your reply to Azuriel, which comes across exactly as I highlighted (i.e. if you lost, it's not because of a strategic mistake, but because of gear/motor skills). I think gear and 'motering skills' bring potential to a match. Intelligence, organisation and actual performance is the other half of the war machine. I actually agree with this post, regardless of how black and white it might be. When you say you attacked the LH from the water, what exactly do you mean? I know the regular route takes you across a little stream. Do you mean you went around the side of the map and came up from the ocean portion of the LH? I'm interested in hearing about this tactic. "she will be able to tell that fighting away from flags.....is wrong." You say this a lot, but it's not correct. Battlegrounds are zero-sum games, one of the teams will win, anything that increases Team A's chance to win must decrease Team H's chance to win by the same amount. Every possible action increases one of the two teams chance to win, and decreases the other teams chance to win. Suppose a member of Team A and a member of Team H encounter each other on the road. 'A' has a choice to initiate a fight. Suppose team A's chance to win the game is A(1) if he does so. If he does not and 'H' does not, they both continue to some node (possibly riding alongside each other to the same destination or possibly splitting up) and Team A's probability of winning is A(2) if they do this. If A(2) > A(1) then player A should not initiate a fight, he should continue to node. However, since *someone* wins, we see that H(1) = 1 - A(1), and H(2) = 1 - A(2). So when A(2) > A(1), H(2) > H(1), so the Horde player should initiate combat. In other words, when two players from opposing teams encounter each other on road, it is always the case that one of them should initiate a combat. If the players ride merrily to a node, you can be absolutely certain that one of them is a moron. I've never said that we never make strategic mistakes. So you're sometimes morons and slackers? That logic really doesn't follow through. I bet that if you asked the losing team whether it was a good idea to leave WW with no healer, not one of them would say yes. There's a world of a difference between knowing in theory what would be the best course of action and executing it correctly in practice, when you don't necessarily have time to think it all through and might have limited information about what's going on at the time. @Shintar: sometimes M&S get into our ranks. They learn very fast or find the door out. @Anonymous with the probabilities: you are right if you assume that the fight initiator person can force a fight. However it's most likely he will dismount, attack someone, do some damage before the attacked person rides away, leaving the road fighter behind. In this case the road fighter is as good as AFK. @water anonymous: it's a horde-only strategy, available to us only when we fight with another ally team and we start at horde startpoint. We put water walking on and ride on the ocean to LH. And if the person in question is not playing to win, but rather to farm HKs? Farming HKs is the most pointless activities ever. Honor from kills is much smaller than honor from win. "Sometimes M&S get into our ranks. They learn very fast or find the door out." This is actually very interesting to me. I admit I haven't followed you for more than a few months, but it's the first time I've seen you suggest that there can be redemption for M&S, which very much changes some of the either/or arguments you make. Can someone, then, be a M&S sometimes, but not always? What does it take to redeem a M&S? Is that a goal of your guild and/or blog? On a "post" note, I agree that superior strategy is far more important than superior firepower. I've done a 5v5 arena and had a dps/CC friend DC as we were going in and been able to beat a full team of five (only once, but it was still one of those adrenaline-high moments of awesomeness that you like to talk about). I've stood with a single warrior (on that same team, for the record) at the top of the Gold Mine Road, healing him, and killed ten (plus or minus) idiot allies as they ran up one at a time to deal with us. I totally agree that strat trumps twitch in PvP. I just wish there was more PvE content that rewarded strategy over fight mechanic gimmicks. Instead, if you find an "easy" way to kill a boss (like pulling Prince into the corner where no infernals fell), it's frequently considered an exploit and fixed or derided. Creative thinking and experimenting for more efficient solutions should be rewarded in both PvP and PvE, but that's not the case. On a final and completely different note, have you noticed that you much more frequently respond to negative comments than positive ones? That trains your readership to attack you if they want to get attention or acknowledgment of their ideas. You get a TON of comments, so I'm not in any way suggesting you should answer them all (or even just mine, though once in a while would be nice), but I just thought I'd point it out. Who knows? I may be wrong, anyway.